I know that getting my kids involved in doing chores is important. 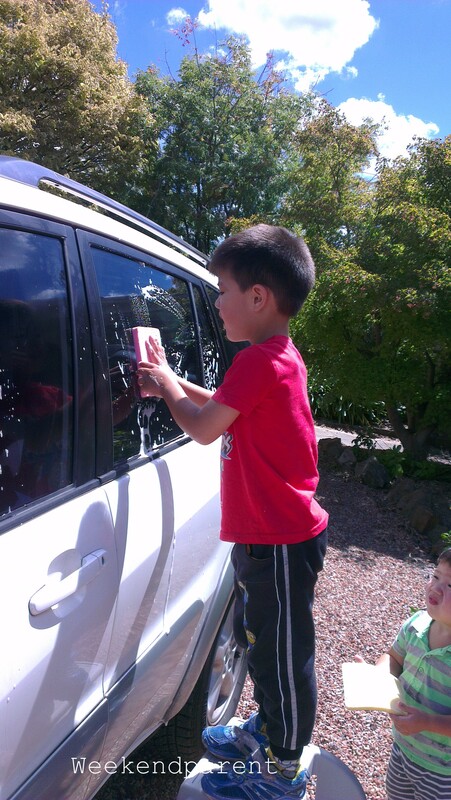 And this was reinforced recently by reading a blog post by friend, educator, blogger and mother extraordinaire Nadia about the importance of getting kids involved in doing chores. Just actually getting them to do it has been a bit, well, of a chore. Up until a year ago, my kids were in Taiwan. Taiwanese (and Chinese) families tend to hover over their kids more than they do in Australia. Although Big A went to a progressive Montessori childcare center that emphasized independence, in practice most families did things for their kids. It was not I think that they didn’t want their children to do things themselves, just that they often thought it was safer or quicker to do things for their children, especially in a dense urban environment. And that is the way that you show love, by being a hardworking parent who cares constantly for their kids – I have been chided by Taiwanese mother-in-law for being a ‘lazy’ mother for letting the kids do stuff themselves. Oh, and in Taiwan we also had a full-time nanny/maid/housekeeper, an angel who spoiled us all despite us protesting that she was doing too much. Consequently – and I hate to admit this – up until six months ago Big A at nearly five years of age could not dress himself, put his shoes on, and horrors or horrors, insisted I wipe his bum for him. There have been big changes in our household in recent months. The kids are growing in confidence and independence. Not having been used to doing chores, I have been gradually incorporating things in rather than turning into dragon dictator mum overnight. Sometimes I am met with “I don’t like that, it is boring!” but still I persevere. But this weekend I decided that I WOULD wash my car. It might be fifteen years old, but I love this car. It takes us to work/childcare/school safety every day. It brings us home. It has taken us on holidays. It is always reliable. It deserves respect and care. 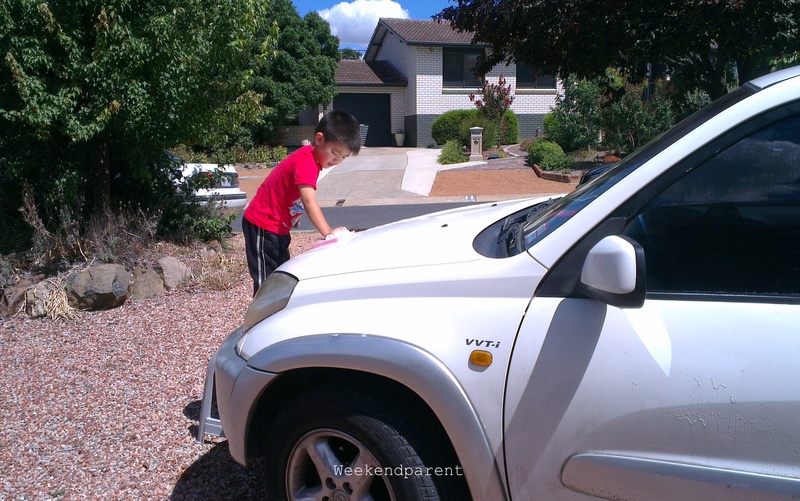 How to find time on a busy weekend looking after my boys? Originally I thought I would encourage them to play in the front yard, ride their bikes out the front, or draw pictures in chalk on the front steps. But Little A ran to the sponge in the water, and so I decided to let him help. Soon Big A decided to give up his iPad for a while and come and get in the action, too. He even went and got a step chair so that he could reach up to get to the windscreen. They had so much fun! Then I went and got the hose. Well, that was (to use a pun) a blast! It was a hot afternoon, which is just as well because Big A thought it would be lots of fun to squirt mummy and his younger brother. Little A thankfully was a good sport about it. Big A was much less so when it was his turn to get wet; he didn’t think it was fun AT ALL. So proud of my boys, and so proud that we did something together that didn’t involve a TV or iPad. What do you think? Is it good for children to do chores? And if so, which ones? 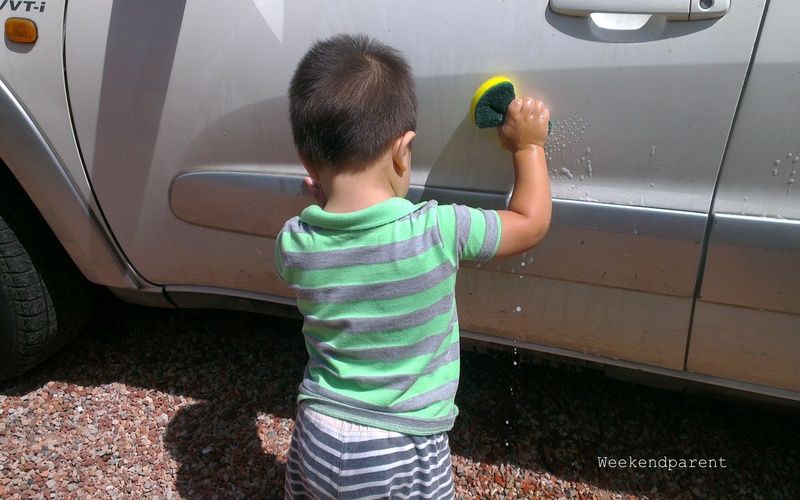 Is washing the car going too far? Or a good family friendly activity.